An ambitious project coming to the well-loved Notre-Dame-de-Grâce neighbourhood, Le Beaumont NDG will bring 150 condo suites and townhouses to 5515 Côte Saint Luc Road. The DevMcGill undertaking focuses on comfort and convenience. The 11-storey building is steps from the Villa-Maria metro station and the Décarie Expressway is easily within reach. Known for its charming brownstones and family-friendly atmosphere, the NDG neighbourhood is home to a number of green spaces such as Girouard Park, Loyola Park, and Trenholme Park. What’s more, there are even several hockey arenas in the area including the public Doug Harvey Arena. The condo is also strolling distance from Monkland Village, know for its variety of cafes, restaurants and unique boutiques. The amenities don’t end there. The condo itself will be home to a variety of on-site perks including substantial commercial space. 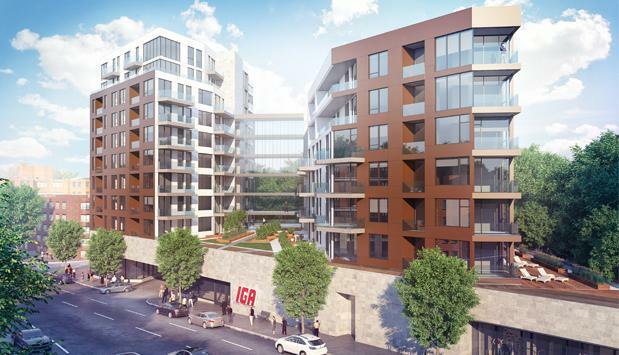 Residents will have the luxury of just popping in the elevator and heading to the IGA grocery store, which will be located at street level. Other conveniences include several common areas including a pool, fitness facilities and terrace space, plus underground parking means you’ll never have to dig your car out of the snow come winter time. The residences come in a wide variety of styles to suit your specific needs. The condos are available in one to three-bedroom floorplans and there’s even a selection of top-tier penthouses. Many of the units come equipped with a balcony or terrace space and there are also garden-level townhouses in the mix. Curious about the game-changing NDG condo? Be sure to drop by the sales centre, located at 5511 Monkland Avenue. It’s open Monday to Friday between noon and 7 pm and weekends from noon to 5 pm. For more information contact 514 800 6841 or beaumontndg@devmcgill.com.